San Francisco’s homeless population is among the highest per capita in the country. In 2003, when Gavin Newsom was elected Mayor, he recognized that existing initiatives and funding streams were failing to address the growing humanitarian and economic crisis. Mayor Newsom tapped Alex Tourk, then Deputy Chief of Staff, to collaboratively create a new strategy for helping the city’s homeless population. Alex began with The Department of Public Health’s Homeless Outreach Team (HOT), organizing their efforts into a larger, city-wide coordination service. His efforts resulted in Project Homeless Connect (PHC), an organization that united city agencies, the business community, several non-profit organizations, and a wide network of volunteers, in order to create one-day events which would provide homeless people with access to a variety of social and health services. By August of 2013, PHC had registered as an independent charitable organization, and is now jointly funded by public and private sources, offering the homeless community on-going, sustainable access to services. Alex’s fifteen years of experience in politics and government provided him with the ability to work across the public, private, and non-profit sectors. His career as a leader began on local campaigns, where he learned to build consensus around candidates, issues, and policies. As Mayor Newsom’s Deputy Chief of Staff, his longstanding political engagement enabled him to address the challenge of eradicating homelessness in San Francisco. Alex grew up in a politically active household in Los Angeles, where the power of public service was impressed upon him at an early age. After majoring in History at Boston University, his interest in social issues led him to a career that focused on creating civic value. Throughout his political career, Alex has always made an effort to engage grass-root community organizations, recognizing ways to involve their voices in political agendas. Alex’s prior experience as a community organizer, including work with volunteer organizations, was critical in helping him balance the needs of the varying interests in the collaboration. His early years as a ground-level campaign volunteer gave him insight into what motivates people to join a cause, a skill he used to manage the expectations of volunteers. Alex was able to convey the necessity of the PHC outreach efforts and one on one interaction with clients, creating a groundswell of support of energy from the community. Years working in government and on the campaign trail introduced Alex to the different sectors’ languages and primary motivations. Alex saw the limitations of the disconnected way in which each sector previously had addressed the problem of homelessness in San Francisco. At the same time, saw the possible contributions that each sector could provide. His vision for a holistic, programmatic effort required what he identified as the varying resources of each sector: the non-profit sector’s ties with the community, the financial and material resources of the business sector, and government’s ability to organize and rally support for the initiative. Alex’s position as Deputy Chief of Staff in the Mayor’s office, coupled with his visibility from the campaign trail, gave him immediate legitimacy and credibility across all sectors. Recognizing this opportunity to “get in the door,” Alex committed himself to learning on the job, using his position to conduct a number of fact-finding missions and to build a wide range of relationships. Later, this network would prove to be a valuable resource when Alex set about building work teams and convening volunteers to help at PHC events. There was a clear agreement that homelessness was a top issue in San Francisco. There were already two city departments with a combined budget of $1.5 billion that had yet to improve the problem. Alex began by using the Department of Public Health’s (DPH) Homeless Outreach Team (HOT) as his primary point of contact. 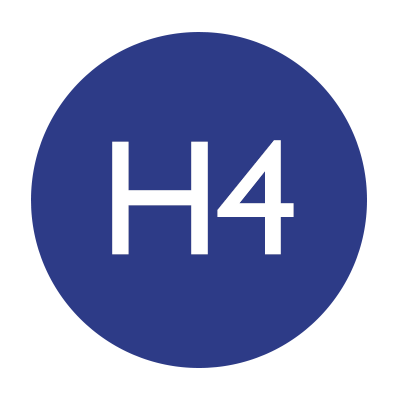 HOT had developed research methods, notably the Acuity Index Form (AIF) – a quick screening that could be used on the street by nonmedical staff in under ten minutes – to assess the needs of homeless individuals and determine next steps to help them. Because of HOT’s resource constraints, they could only offer case management to those individuals who were particularly vulnerable. Alex used HOT’s AIF to determine what goods and services PHC events needed to have the most significant impact. Despite the myriad programs and organizations already in existence, many homeless people faced barriers in accessing those resources, including difficulties navigating the various systems or a lack of awareness of them. Alex devised a strategy for providing a range of services in one place. He convened over 30 people who provided a wide variety of services to the homeless, and invited anyone with some connection to the problem to participate. The meeting signaled a new, inclusive process, which would allow providers offer the best possible structure for helping the homeless. Alex specified that though he was leading the effort, he did not have all the answers and would continue to submit PHC’s decision-making to regular meetings of those involved, relying on HOT’s expertise to organize the initiative. Alex knew from his years as an organizer that the best way to build trust with others was to listen well and deliver promptly. After hearing HOT’s concerns about not being able to contact their van service while they were in the field, he negotiated with Sprint to provide cell phones for the team. Sprint offered further support by providing free calls to homeless individuals during PHC events, allowing them to reconnect with their families. HOT likewise provided training to train volunteers for PHC events. Critical to the organization’s success was the agreement among agencies and partners to share information, which lead to more timely and effective delivery of services. For example, city officials shared their shelter reservation process with PHC staff to make sure they could place people in beds on the actual day of a PHC event. The homeless issue was one of Mayor Newsom’s campaign promises – he had supported a ‘Care Not Cash’ initiative that reduced the monetary assistance provided to homeless individuals and provided, instead, service-based assistance. This initiative, later voted on as Proposition N was implemented in 2004. His continued public and financial support of HOT and, eventually, PHC provided star power to the effort, which Alex operationalized to create both momentum and a clear path forward. The engagement of so many business and civic leaders, including the San Francisco Giants added visibility to PHC’s events. PHC publicizes their results immediately and celebrate their successes. PHC conducts a same-day debriefing of both volunteers and homeless clients to get feedback on what worked and what didn’t. Assessing what keeps consumers from participating (such as pet sitting, child care, transportation needs, or wheelchair access) allows PHC to adapt their model to remove these barriers for future events. Alex allocated responsibility to different organizations, providing them with control over the activities in which they had expertise or interest. Hospitals and clinics provided doctors, nurses, dentists, and optometrists. Companies including Sprint, Google, and Wells Fargo provided cell phones, voicemail, and financial advice. Non-profits like the San Francisco Food Bank provided tens of thousands of pounds of groceries, while volunteer lawyers provided assistance to clients with understanding and applying for benefits. 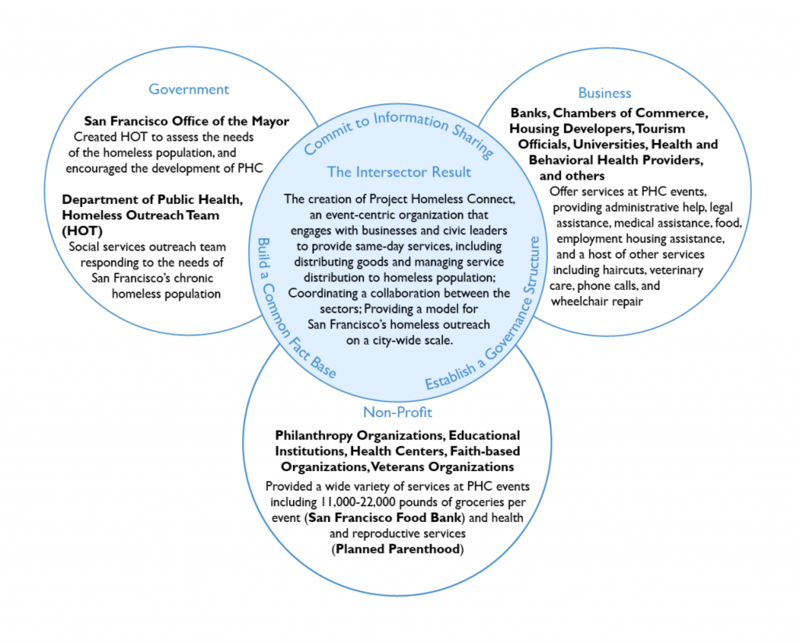 National model of PHC events adopted by the United States Interagency Council on Homelessness (USICH), utilizing the program in over 200 cities and abroad. Everyday Connect, a location in San Francisco with regular weekday office hours, connecting clients to comprehensive social and medical services (including medical and mental health, addiction treatment and recovery services, food, clothing, computer access and classes, transportation, employment services, medical, SSI, SSDI, income assistance and other financial services).